Overhead was the day nursery, with a wide extent of smooth cork carpet (the natural terrain of toy soldiers), a large box of bricks—such as I have described in Floor Games—and certain large inch-thick boards. It was an easy task for the head of the household to evict his offspring, annex these advantages, and set about planning a more realistic country. (I forget what became of the children.) - H.G. Wells, Little Wars. The forced march that is our housebuying carries ever onwards, inch by struggling inch through the mud of official indecision, redtape and incompetance, heedless of the howling storm of national financial catastrophe. In the meantime, I've had some of our very best men working on the problem of what sort of table to put in the wargames room. As you can see to your left, they are deep in discussion and are in no way wondering if this is not putting the cart somewhat before the horse. In brief, I have (or hope to have) a room that is approximately twelve feet by forteen and wish to put as large a playing surface as I may into that space while still having space for books, toy soldiers, terrain, smoking & drinks cabinet and all the other necessities of a civilized existance. There is the other, entirely secondary concern, that the room may also on occasion have to be used for social events that do not involve toy soldiers so it would be best if whatever playing surface I adopt can be folded away to allow the passage of guests, wives and other harmless persons. 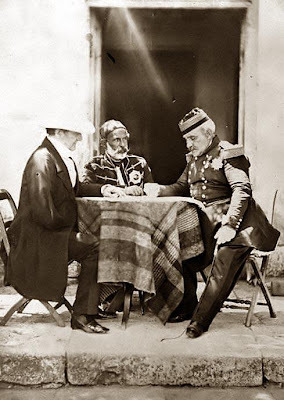 The Command & Colours series (Napoleonics, Memoir '44 and Battlecry) have made up the majority of my wargaming since 2005 and that is unlikely to change, so it worth bearing that in mind. I have two mats for that style of game which measure six feet by three feet and nine inches. My prefered method of play is a six to eight player game where two of these mats are placed side by side (known as "Overlord") making a playing surface nine hexes deep by twenty six wide, unfortunately this would require a table twelve feet long by four or ideally five feet. This is unlikely to fit and even if such were possible, is unlikely to leave room for much else. 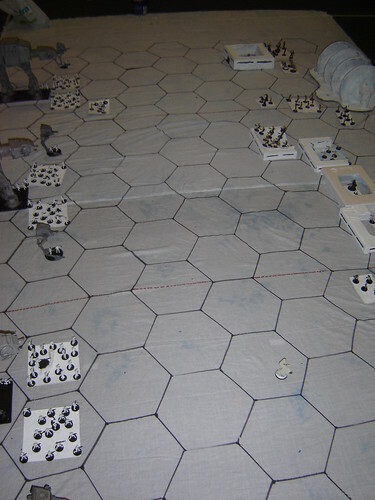 However, the game can also be played in "Breakthrough" format where two mats are placed one atop the other forming a field of battle thirteen hexes wide by eighteen deep. This would need a table six feet wide by seven feet deep and ideally a little bigger to allow for dice, casualties, gin, etc. This is probably achieveable and could certainly big enough for whatever other games I take it into my head to play. I've been looking at folding ping pong tables as the basis for this putative battlefield. In their favour, they are sturdy, fold up and measure nine by five feet, a noble size for a wargames table in any man's language. Counting against there is cost, 200 euro for a solid model and the fact that even five feet by nine is a touch too small for my purposes, nine by six would be ideal. I'm sure even a chap of even my limited skills could add a foot to the width of the table without too much trouble, but until Chateau Kinch is a reality this will have to remain an entirely theoretical exercise. Still a very pleasent theoretical exercise and one that helps make the hard business of getting through the house buying forced march a little easier. Frenchmen, deployed on my Hotz mat. I had some good news on Thursday, GMT games finally charged my credit card for Command & Colours: Napoleonics, which most likely means that I'll have the finished game before Christmas - which is immensely satisfying. It did of course, throw into high gear my thoughts on howI was going to play the game with figures. This picture does no justice to the lavish scale of the game. I was offered a bespoke hex mat recently by the wife of a very dear friend of mine. He had run a spectacular game set around the battle of Hoth from the Starwars films using 28mm figures. This was an opulent affair with three massive AT-AT walking tanks attacking rebel alliance entrenchments defended by Luke, Chewie and chums. The game ran using a version of the Memoir '44 game system and was played on a standard Memoir 44 mat (9 hexes by 13) with massive ten inch hexes. I had entertained hopes of commissioning such a mat, but it would mean that it could only be useful when laying on the floor and most of my pals are less enthusiastic about floor games than I am. So I think I shall have to make do with my two Hotz mats and let pipedreams of gigantic wargames tables go the way of all fancy. representing in this instance three units for Command & Colours: Napoleonics. 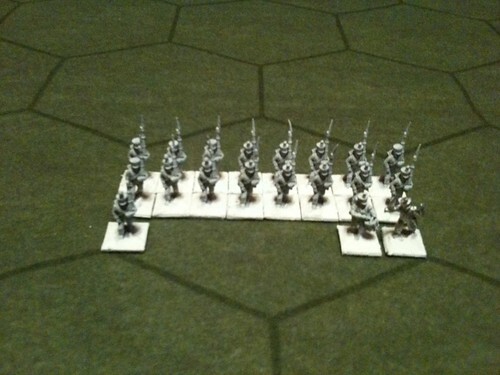 My Napoleonic armies are based on card sabots three inches across with two sabots making up a unit. I had thought this was going to be a problem as it meant that the bases were an inch longer than the five inch hexes. This isn't really an issue for an isolated unit, but it makes deploying a Napoleonic line of any size problematical. However, after removing the figures from the sabot and laying them out, they just - as you can see in the picture above - fit the five inches allowed. This has settled it - I may ask my friend to run me up a mat for the mediterranean, but I think it will have to use the smaller and more practical five inch hexes. shaking it at the soldier, called out, "Oh you scoundrel!" 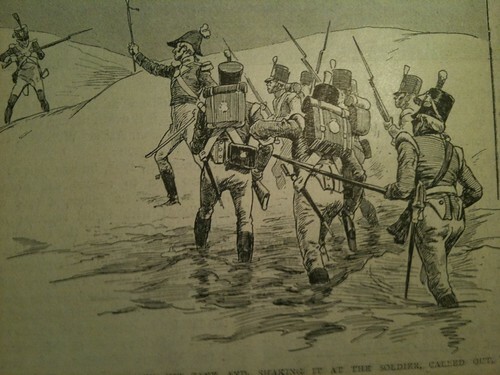 The above illustration is taken from the article on Abercromby Expedition to Egypt in 1801 and describes an incident where a French skirmisher made so bold as to fire on a British officer shortly after alighting from his landing craft. One of the other aspects of the article that really appeals to me is that the author makes every effort to sound like an objective and disinterested historian during the opening section, but as soon as bayonets cross he begins to lose the run of himself. No longer does he state that the French artillery opened fire on the British infantry as they reached the shingle or that the French cavalry attempted a charge before the Guards could form square, it's "...the French artillery began to fire on our line, " and "our lads began to fall and we strove forward through the fire and cleared the breastwork with the bayonet." I can see him getting excited and blotting his manuscript as the prose rushes on. 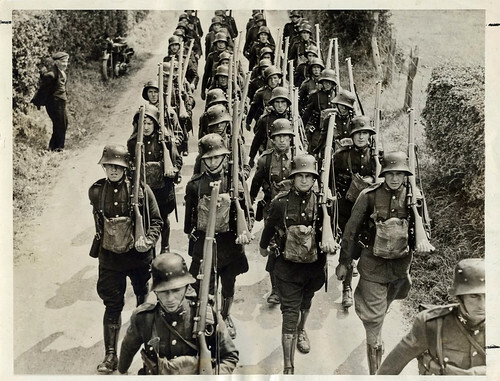 Troops of the Irish Free State on maneuvres in the 1930s. Note the German inspired, British produced Vickers helmet. My knowledge of the history of the Irish Army is slim and limited mainly to my own efforts defending the nation against the paramilitary wing of the Wicklow Ramblers Association in the late 1990s. You'll find an article from the Defence Forces website here. 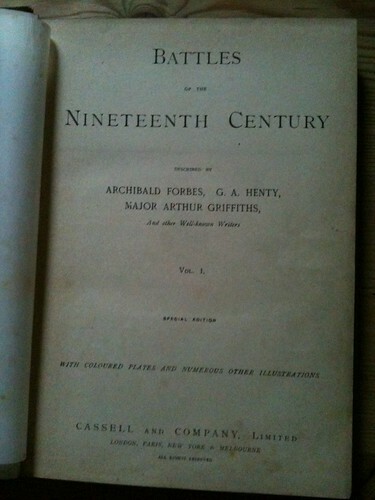 Eunan O'Halpin's "The Irish State and its Enemies since 1922" is generally considered to be the best foundation on the subject and it's well worth a read. His introduction to "MI5 and Ireland 1939-1945: The Official History" is worth the price of entry alone. While the above books are extremely interesting, they probably lack the uniform detail that wargamers crave. Donal MacCarron's Osprey on the subject is by necessity impressionistic as it covers a great deal of ground, but is well worth a look. You'll find some information on our own home grown fascists, a pretty sorry lot I think you'll agree*, here. I'm not aware of any manufacturer that makes Irish troops for the period in any scale. 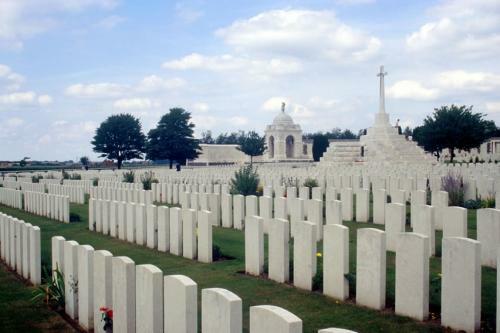 I would recommend using German troops from the last years of the Great War, possibly with headswops for the officers who had a rather more British cut to them. Vehicles would be a mix of British Great War and Interwar types. *I had a teacher in school who put down the abscence of any credible right wing movement in Ireland in the 1930s to Irish peoples lack of interest or ability in political extremism. It was a statement that made me choke on my cornflakes even at the tender age of 11. I think a far more likely explanation for the poor showing of the Blue Shirts was that they came late to an already crowded market. be impersonating a Portuguese Heavy Dragoon. There's been quite a to-do in the Kinch household of late - some family issues and yet more anxious waiting on the Mortgage people. All of which has very sadly impinged on my very limited gaming time. The big news of course, is that we've been given "approval in principle" for our mortgage - which given the current circumstances is a minor miracle. And to think it took only eight to nine weeks of relentless bullying to get a straight answer out of the lender. This is very exciting news, not least because it means that we will be returning to the heart of Dublin which will make having a social existence that doesn't have to be planned with military precision. I understand that putting an establishment in order is a big job (I forsee making shelves, lots of shelves) it will also mean that I will be able to do a little more gaming. This will of course, severely circumscribe the war chest for a few years and has certainly knocked any new projects on the head for a while. Napoleonics will be the priority for the next while, ensuring that I have the full complement of chaps for Command & Colours: Napoleonics should keep me busy for the next six months. Eagle eyed readers will no doubt have spotted the gallant Latin chap bestride a horse at the top of this post, he is a French Carabinier from Newline Designs. I'm happy that he's a close enough match for a Portuguese Heavy Dragoon. 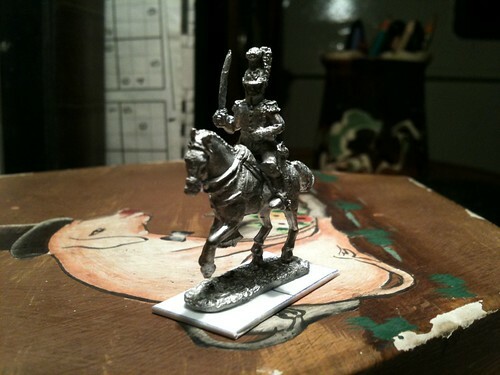 Once Mark has got the current crop out of the way, it'll be time to send this fellow and the 5th Dragoon Guards off to wreck havoc on the French hordes. In a moment of madness, I was toying with some ideas for a new period - one of which was a small Falklands War collection. This was mainly inspired by some articles in a TwoFatLardies special and this rather magnificent blog. I've always been interested in the Falklands as one of my officers in the Army reserve had served there and I once took part in a campaign game set there**. I was planning to use a modified version of Memoir '44 to game the conflict, which would have allowed me to collect from Cold War era British, who could shoot Donogh's Soviets when they weren't off putting small islands in the South Atlantic to rights. Realistically however, I don't think it'll be an option. *Note to gentlewomen of a sensitive disposition, do not type this as a search term into google. You will not find Donogh's scenario. **Readers of the Classic Wargamers Journal will find the full story in the next issue. Today was a fine lazy day and much needed. Mrs. Kinch's birthday festivities were celebrated last night and a good time was had by all - though this did mean that I was in a somewhat delicate state this morning and this afternoon. And also if I'm honest this evening. While perhaps, I gave Bacchus rather more than his due last night, I wasn't helped by having to work late into the afternoon and then head straight into the festivities. The result was twenty three hours awake on three hours sleep and not one calculated to leave young Master Kinch in the most sparkling of forms. I spent most of the day hiding under a duvet while Mrs. Kinch watched the magnificent David Jason as D.I. Jack Frost. I emerged pale and quaking, a wrecked half shadow of a man, the merest spectre of my former self to be restored by a cracking chicken dinner. I did do some productive work though in amongst slobbing about. 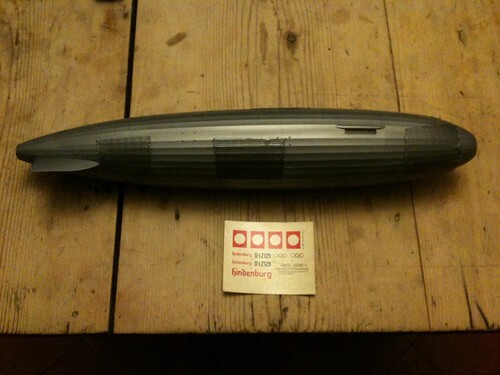 I had promised Donogh that I would make him a zeppelin for his Great War dog fighting games and he provided me with a copy of Revell's Hindenburg set, which I started work on today. The basic structure is sound, though I shall have to look at some pictures of earlier zeppelins to work out what sort of gondolas, etc I shall have to bodge together. Donogh wants to use it as the centre piece of a sort of Great War version of the Death Star scene from Star Wars, so I may have to gild the lilly somewhat and make it a little more fearsome than in reality. I think it could certainly benefit from the addition of a war elephant, don't you? 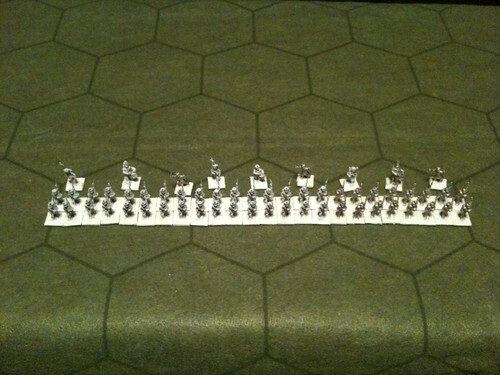 I also sprayed some 20mm British Heavy Dragoons that I got from Newline recently, you can see them above. Mark is booked up with work at present, so I won't be sending these over to him any time soon, but they will form the main body of my British heavy cavalry. 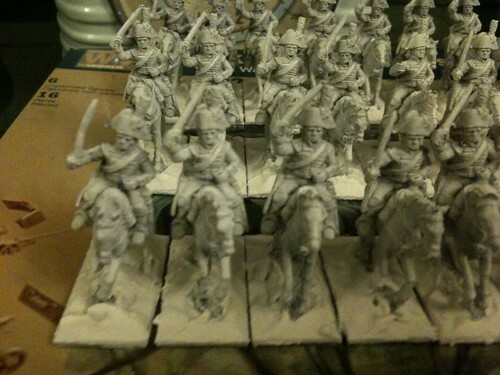 I hope to have them done up as the Fifth Dragoon Guards of Salamanca fame. I also resubmitted a copyright clearance request to Project Gutenberg in relation to a super secret project that bears no relation to the above picture.